Providing an extensive range of high quality doors for over 4 decades in Coventry, Warwick and Rugby. The front door of a house represents the first impression that your home gets to make. If it’s a shabby, tired looking wooden door that’s letting in a chilling draught it won’t make for the most appealing of welcomes. An expertly fitted uPVC door can improve the look of your home, make it more secure and lower your fuel costs. Whether you need internal or external doors – you can rely on our team to find the perfect door to complement your property. If someone visits your home, almost the first thing that they will see is the door which you open to greet them. If your door is old, shabby and ill-fitting, that first impression may not be the one that you would wish for. Let us at Victory Windows fit a new Upvc door for you and that will be rectified! 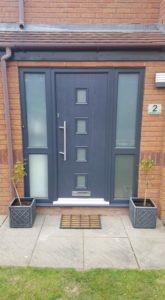 With our many years experience of fitting doors in the Coventry, Rugby and Warwickshire area you can rest assured that your door will be fitted to the highest professional standard. Not only will our team of expert fitters carry out a first class job in the fitting of your new door, but they will ensure that they leave your home in as clean and tidy condition as they found it, causing you the least possible disruption. All of our doors carry a ten year guarantee, giving you peace of mind that you are buying the best in both product and installation. As well as adding beauty and style to your home, a new door from Victory Windows will also provide both extra security for your property and full insulation from the wind and cold, and keep precious heat where it belongs – inside your home! So, whatever door you are looking for, whether it be internal or external, give us a call at Victory Windows and we will be happy to give you a quotation and ensure that you get exactly the door you are looking for. As well as supplying new UPVC doors we also provide a repair service in Warwick, Coventry and Rugby. If you have faulty locks, broken handles, dropped hinges or misted double glazed glass units we can repair or replace them. Simply call our friendly team today or contact us by completing our online enquiry form and we can begin discussing your uPVC door requirements today. Many thanks for fitting the two windows. You have done a really good job and my windows look great! I just wanted to say thank you as I am really pleased with how the new windows look, and the house is noticeably warmer too! Also, thanks to your guys for fixing the gutter!